A complete "Dry" nitrous system for you 87 - 98 Ford Mustang GT. Everything is included for a safe, proper installation. • Designed to work safely on both stock and high-performance Mustangs with normally aspirated engines. 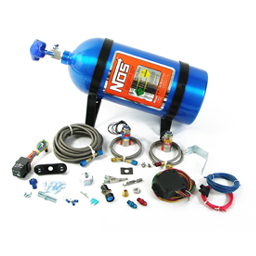 The ideal nitrous system for many fuel injected performance vehicles. 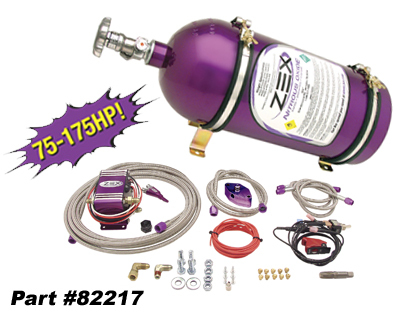 • ZEX Nitrous Systems for Mustangs have an advanced, patented feature called "Active Fuel Control". This feature monitors nitrous bottle pressure and adds or subtracts enrichment fuel. The engine never runs too rich or too lean when engaging the nitrous system. • ZEX "Dry" nitrous systems for Mustangs activate at wide-open throttle, using advanced electronics that monitor your engine's throttle position sensor. This makes using your nitrous system very easy and reliable.